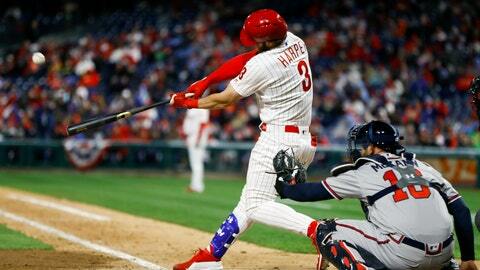 PHILADELPHIA (AP) — Bryce Harper is ready to raise a li’l slugger in Philadelphia. Harper announced Monday on Instagram that he and his wife, Kayla, are expecting their first child, a boy. Harper posted a photo of him and his wife holding a “Baby Harper” No. 3 jersey in front of the Benjamin Franklin Bridge. He posted a second photo of a sonogram on top of a baby Phillies jacket. The 26-year-old outfielder did not announce a due date. But the baby can almost take the wheel by the time dad’s $330-million, 13-year contract expires with the Phillies. Harper was a big hit in his debut weekend with the Phillies, hitting two mammoth home runs and leading the Phillies to a 3-0 start. “Congratulations to @bryceharper3 and Kayla!” the Phillies tweeted .